Online money making is at it’s best, most of the guys who are connected to internet and technology keep on trying to get some cool cash from Internet. There are many ways you can make money online. One of the ways is Blogging. The best ad program to monetize the blogs is Google Adsense. Though, there are hundreds of other ways to monetize a blog, this Google product has made a strong identity by helping bloggers earn decent money out of their efforts. So if you are reading this blog post, you must be a blogger who wants to make passive income with Google Adsense Program. Right? Once you get the Adsense account approved, you need to place the ad codes on your blog. You decide the spaces where you want to show up the ads, but did you ever think that the spaces where you are showing up the ads can get you the best CTR? It’s tough to calculate until you run the ads for a month or two, and then analyze. Sometimes, after testing different ad spaces gives you a fair idea of the best performing ads, and you start showing up ads accordingly to get good earning. But there are times, when your WordPress blog theme is not able to give the CTR you expect due to an imbalance of Ads and the content. There are many WordPress theme creators who work hard to create the themes that are better optimized for Google Adsense. Those themesare known as Adsense ready themes or Adsense optimized themes. In this blog post, I am going to share 5 best Google Adsense Ready WordPress Themes to choose from. 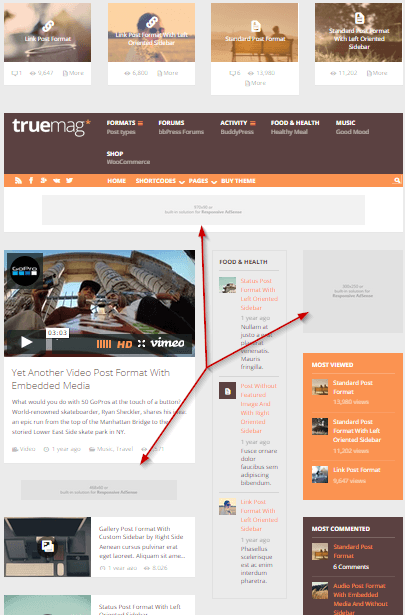 Priced at $58, Truemag is one of the best Adsense ready themes available online. The theme is fully responsive. Therefore you don’t have to worry about anything, just put the responsive Ad units on certain locations and rest assured. It will work great on all devices without breaking the site and the ad blocks. Truemag comes with different skins that you can use as per your requirements. It is compatible with WooCommerce which enables you to integrate an online store as well on your blog. 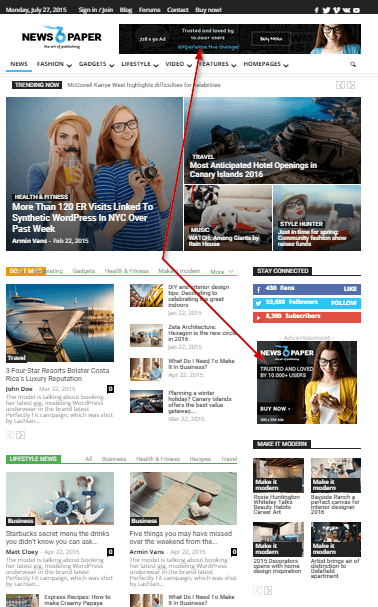 Newspaper theme is an image rich WordPress theme. 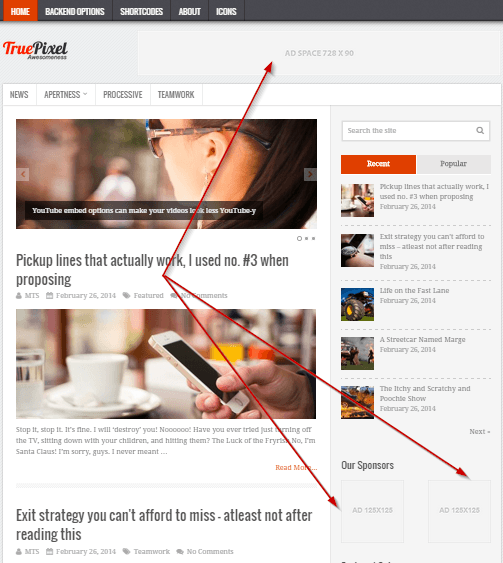 It has multiple ad locations such as one at thetop, andsecond in the sidebar on the front and post pages. Priced at $58, this theme comes with inbuiltshortcodes and templates as well. The theme has an option panel that lets you customize the theme as per your requirements. It has support for BuddyPress, bbpress, and WooCommerce. It is compatible with Bootstrap and WordPress 4.2+. Priced at $69, TruePixel theme is designed by MythemeShop. 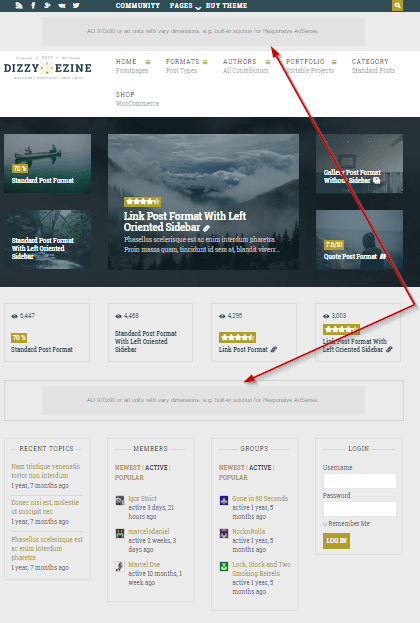 This Theme has multiple ad locations for home and internal pages. It is fully optimizedfor Adsense to give you the better CTR. It has two different layouts. Like other Mythemeshop themes, TruePixel loads faster which helps in better search rankings because Google has recently added Mobile friendliness to its ranking factor. This theme has a lot to offer, so stop waiting and get this theme right now to take your blog to the next level. 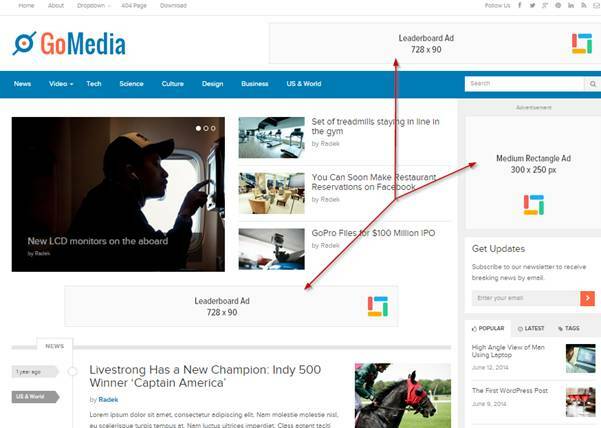 If you want to create a news site, Gomedia theme is perfect with 4 Ad locations on the home page. However, you can see 3 in the above screenshot. As you know you can show only 3 ad units of thesame kind, it has the option to disable the ads as well. So you can disable one or use another ad type to follow the guidelines. Gomedia has been designed by popular theme creator, Theme Junkie, which priced this theme at $49 that is worth. DizzyMagis one of the best Adsense optimized themes as it has large Adsense blocks at the top, middle and at the bottom of the home page. And on the post page, along with the top & bottom ads, two more in the sidebar, and one above and one below the featured image. You can see there are so many ad locations prominently exist in this Adsense ready theme. It can offer you the best CTR. Everything is already done, so you don’t have to put a lot of effort to optimize your blog for better CTR. It also offers featured review and rating systems that get you rich snippet in Google for more traffic. The theme is priced at $58, and I think the price is very well deserved as it offers a lot. Getting approved for Adsense account is tough at times, but somehow you can get it easily if you follow the guidelines. Once you get the account, you have to think and plan how you can get most out of it because just placing ads on your blog is not enough to make some real money. You have to increase the search traffic of your blog as well as place the ads at the best locations on your blog to get the best CTR. The 5 themes I have listed in this blog post are good from all aspect as they load faster which is Good for better ranking and they have a right balance of textual content, Visual content, and the ads which are good to keep the audience interested in your blog. Therefore, stop waiting and check out these themes, and select the one as per the requirements. These will surely give you the best CTR on your Ads.